By now, you’ve read the conference highlights, and learned about new features from Store Visits to Smart Bidding. What we’d like to explore is the implications behind these announcements. Google’s focus at the conference was on machine learning, automation and simplification. This sounds like the exact opposite of every campaign an agency has ever created. Adjectives like “easy,” “simple” or “quick” would never be included in a campaign build. The products below are some of the highlights that focus on combining machine learning and paid search. They might not all apply to your current advertising needs, yet think how you might be able to take advantage of the new features and which ones you’d like to prioritize testing. This is Google’s new product “for small businesses specifically.” These campaigns incorporate machine learning from Google Ads into an easy-to-use interface to help small business owners drive real tangible results. This new automated account management will eventually replace AdWords Express. Advertisers can set store visits as a conversion type in their Search & Shopping campaigns. Target ROAS will allow advertisers to work towards an omni-channel return, which was previously difficult to optimize for. This technology is all about creating advertising that matches a user’s context. Smart bidding for store visits allows advertisers to optimize against total store conversions or the total conversion value. For businesses whose primary goal is to drive in-store visits, this product can be used to optimize for store visits only with a cost-per-visit goal. Previously known as Universal Shopping Campaigns, this new format will “drive simplicity, performance and reach” by using machine learning to optimize towards a retailer’s business goals. Smart Shopping Campaigns consolidate Shopping and Display Remarketing campaigns into a single feed for easier management. A unique ad format that simplifies the creation and management of search ads. It lets advertisers provide multiple headlines and descriptions that will be used to generate (by machine learning) a single ad to show the right message at the right moment. By embracing the new Responsive search ad format, advertisers can potentially show a text ad with up to three headlines and two descriptions. This format changes advertising as we know it. This is a cool new automated campaign type that leverages Smart Bidding. It’s designed to optimize for offline visits (store visits) and sales. These ads appear across Google’s sites and networks like Search, Maps, GDN, & YouTube. Can you say small business win? Expect to see these released in the upcoming months. A new bidding strategy for TrueView advertising on Youtube in-stream and bumper ads, it measures the effectiveness and strength of a brand through lift bidding. In short, you can use these ads to determine how users feel and respond to messages about your brand. Maximize Lift is being released this year. Our consultancy has a lot of experience with Google products. After all, we are a Google Marketing Platform Partner. We’ve experimented with all of their Smart solutions like Smart Goals in Google Analytics and Smart bidding solutions in Google Ads like Maximize Clicks and Maximize Conversions, smart ad rotation and ad formats like responsive display. Some have worked very well. Some, not so much. But you should always test! Even though we don’t receive the best outcomes from those tests sometimes, we’re going to continue to experiment with new products. Google’s AI and Machine Learning capabilities are always improving and we’re excited to see them develop. While you might have struggled with some of Google’s smart products in the past, we encourage you to keep experimenting. Nothing will ever replace your brain power and advertising experience, but it’s important to remember that machines can be smarter than we are and they have more time. So if a machine can help you do your job better and stress less in the meantime, let it help you. Machine learning doesn’t mean less control, it means more opportunity. Create a Campaign Experiment to test against your own campaigns and see which performs better. Once you know it works, you can continue to use that smart bidding strategy, ad or campaign type without worry. This is especially important for small businesses. Your budgets are small, and that’s okay. But these experiments will help you stretch your marketing dollar. 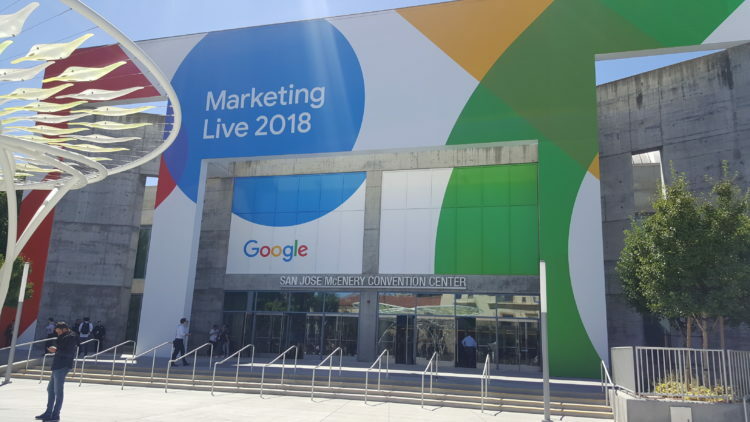 Google Marketing Live 2018 showed advertisers that Google is undoubtedly moving toward a machine-learning world. They’re testing everything and using the results to push the limits of advertising while maintaining results, transparency and customer loyalty. Their dedication to improvement is helping to create an effective set of tools for advertisers from all companies, big and small.